Production time - 5 months from order. The workmanship of the hull and fittings throughout shall be of DNVGL Rules. In way of bollards and lifting eyes, deck will be strengthened by internals and reinforced under additional stiffening will be provided as necessary in way of engine seats. Thickness scantling shall be calculated according to DNVGL Steel Construction Rules. Engine compartment will be spacious to enable ample access to perform repairs, maintenance and easy removal of engines. Access to Engine Room through forward doors in W.T. bulkheads and through W.T. hatch located on top of main deck. Fire insulation will be done as per DNVGL requirements. 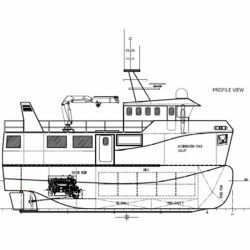 Wheelhouse will be fabricated in Aluminium 5083 Series and will be placed at the fore ship centre side as seen on the general arrangement section for easy operation. 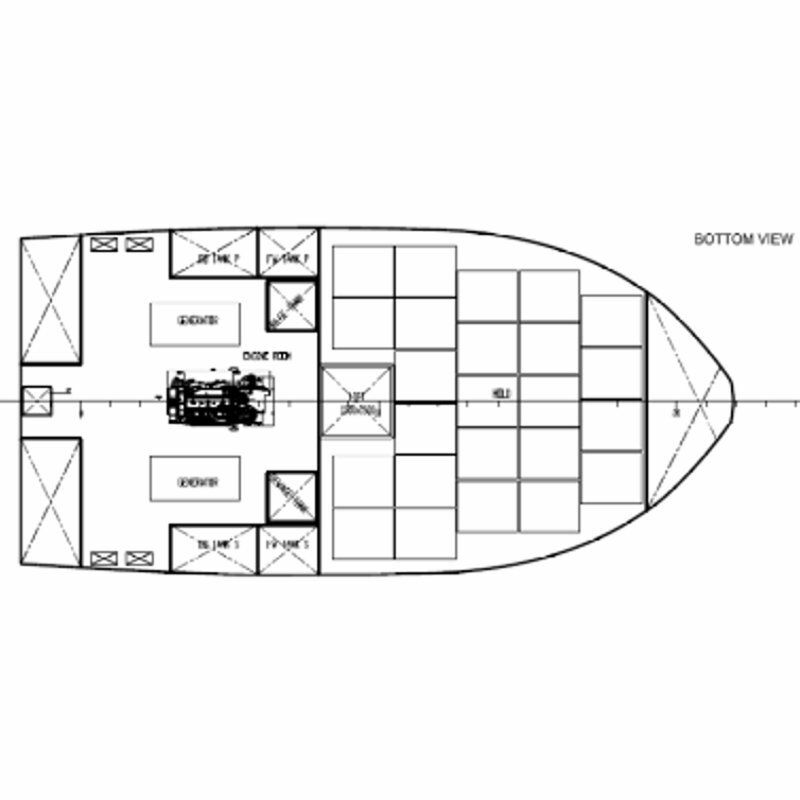 Windows sizes as shown on plan good view of aft and fore decks. Windows and doors will be placed as GA plan. Engine control panel will be installed to control oil pressure, cooling water temperature, engine tachometers, batteries charge ampere meter and additional instruments needed to effectively control the propulsion system. Instrument panels arranged in an ergonomic way to have good visibility angles and ease of operation by the helmsman. One comfortable chair shall be installed on adequate foundations. Linings /Ceiling Face will be PVC panel white colour. The tanks will be situated according the G.A Plan and in adequate capacity in comply with DNVGL Rules. Filling from deck with single line and filling by flush seal type deck connections. Each tank will be provided with an inspection manhole of acceptable size. The filters type and capacity suitable for the engines. The filter shall be positioned at a convenient place in the Engine Room. Fuel lines will be steel seamless pipe and engine connection ends will be flexible. The engine will be in accordance with standard delivery, equipment and specifications. The helm control console shall be fitted with a comprehensive engine monitoring instrument package from Volvo Penta. The sea water supply system consists of one sea chest/filter arrangements cross-connected via valve. Valves should be Gate valves and ball valves. Engine is provided with a closed cooling system, which circulates fresh cooling water via the tube cooler and an expansion tank. The cooling water pipes to be connected to the engine via flexible hose. The fresh and sea water cooling pumps are engine driven. The main engine and diesel gen sets exhaust pipe to be ducted through side of the E:R. port & starboard direction. The steel expansion joints shall do the connection of the exhaust lines to the engines. The exhaust lines, care shall be taken to prevent entry of water into the engines. Exhaust pipes shall be insulated with proper thermal insulating materials. Reverse reduction gearboxes to be engine mounted and of good marine quality. Spare parts are an optional and will be delivered with boat as per client’s request. Diameter and pitch of the propellers will be designed as to meet the rating of the engines and the required specifications. Propeller material to be of bronze. Propellers are to be balanced, keyed and tapered bored, secured on shaft with tapered nut (cap) and securing bolt on this nut. The propeller shaft will be of Stainless steel. 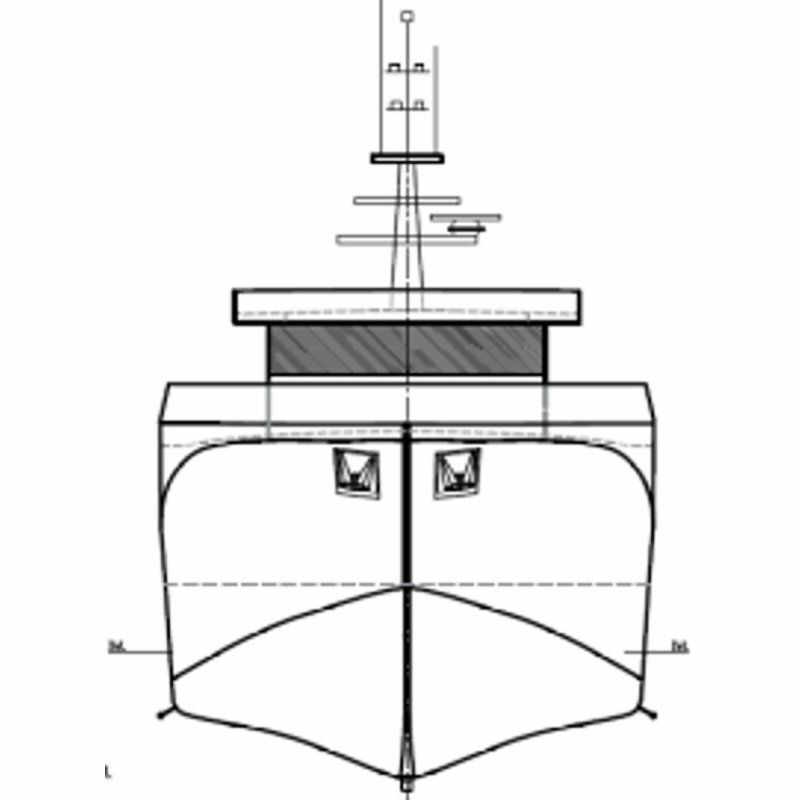 For repairs, stern shaft is to be drawn outboard. Rudder blade, Rudder stock welded to the rudder blade. Top of tubes to be supported by strong back supported from hull structure. Tillers connected by tie bar. Steering provided with a manual powered hydraulic system that controls the rudder position. Total Rudder Angle : 2 x 35 deg. All hydraulic pipes will be seamless of high-pressure steel pipe. Filling of hydraulic oil to be easy accessible located. The battery charging system is designed to ensure that all batteries can charge all times from main engines. 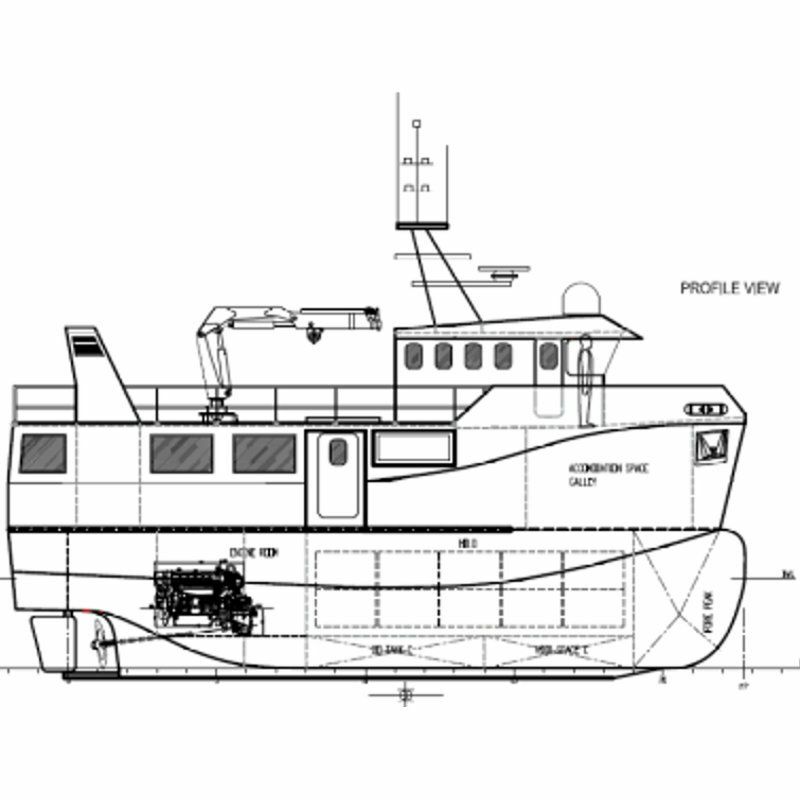 All electric and electronic equipment is to be suitable for marine service. All cables and wires of approved marine type and to be secured by clips and mechanically protected where necessary, or laid in cable channels. Control cables to have spare conductors according to shipyard practice, where exposed to mechanical damage, cables to be suitably protected. All cables to be labelled by labels numbers. Switchboards/distribution installed within the panels to be easily accessible for operation and maintenance. - Circuit breakers for the consumers. Fuses and breakers to be in one switchbox and located in the wheelhouse console, easily maintained and operated by the helmsman. Circuit breakers shall be clearly marked with nameplates. The electrical system on the engines shall be protected in the engine’s instrument panel, so no further outgoing circuits for the engines shall be in the above mentioned circuit breakers board. The switches are to be fitted in the instrument panel of the helmsman’s console for operating the equipments. Hydraulic system schema and calculation will be approved by DNVGL and made by AKMARINE as per class requirements. All hydro-pumps will be fitted on dedicated hydraulic tank. Each hydro pumps will be enough capacity. All are to be provided and selected as per above unit’s manufacturer specification. All driving and control valves in the system will be provided from BOCH REXROTH. All pipe and flexible pipe are to be met DNVGL rules and certified as required. Oil heating will be controllable with electrical resistant and cooler. After installation of system and piping, pipes will be properly flushing. 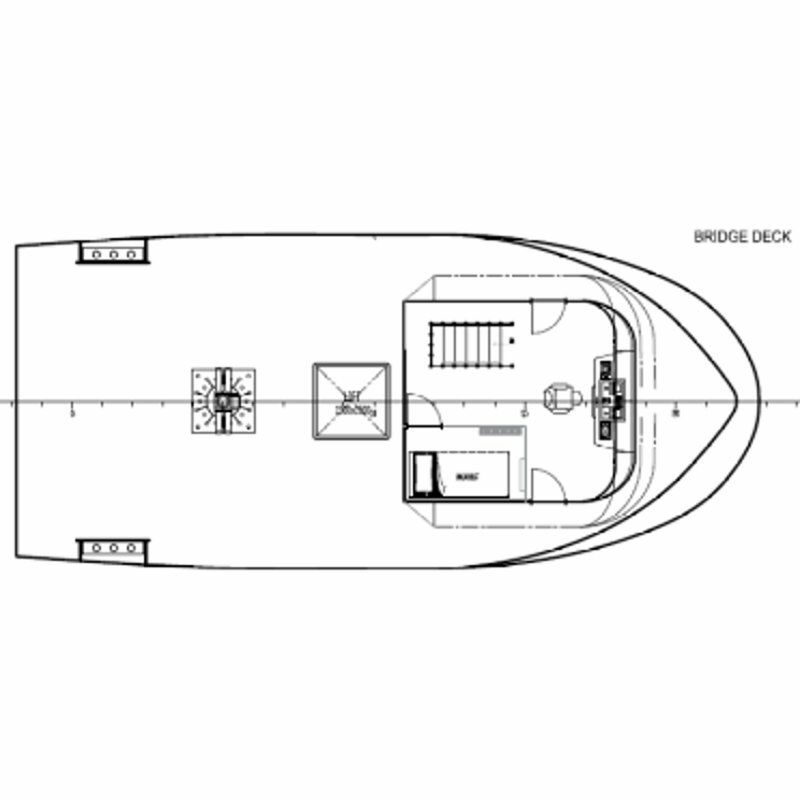 1 x Bow and 1 x Aft hydraulic thruster will be fitted to the ship’s hull. One bolted W.T. access hatch will be provided on main deck above the Engine Room, for engine maintenance and/or removal of engine parts. 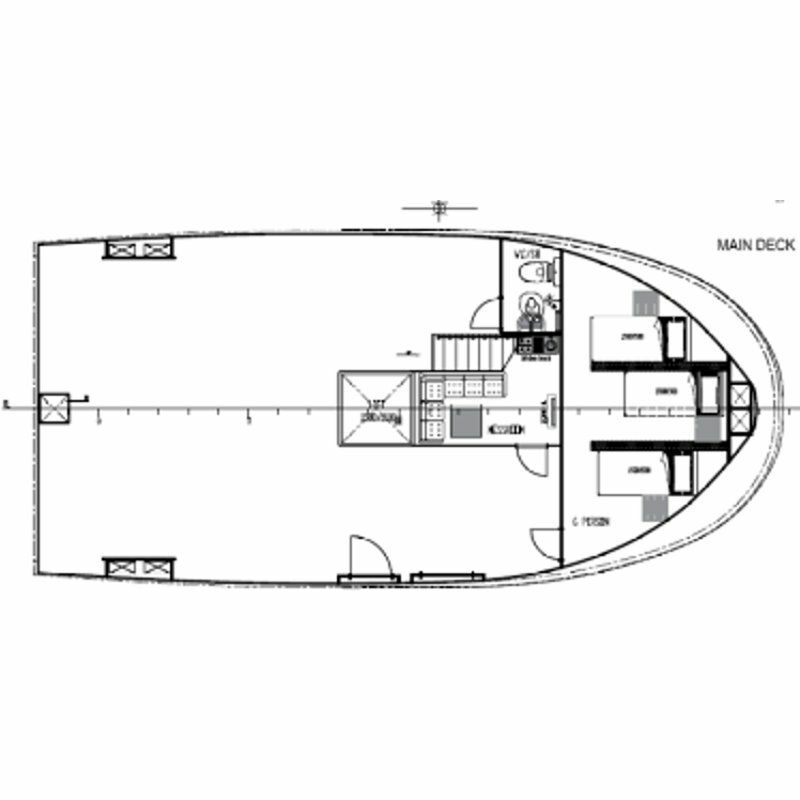 Steel doors for access to wheelhouse with window will be provided. Windows will be provided all around the wheelhouse. Frame profiles between windows to be as narrow as possible so as not interfere with the visibility. The forward windows to be provided with electrically operated, wiper. An Aluminium mast will be fitted to top of the wheel house shall be designed to carry the navigation lights and antenna. Outside bulwarks will be provided around the superstructure. Height of bulwarks shall be below windows. All around the Boat at main deck level round Dia.-150 mm steel pipe fender to be installed. Ladders are to be of steel material. One upper deck ladder will be installed.